Fishing Article, Keep Your Bait Alive, (and still be) Minnesota Legal - Jeff Sundin Updated April 2012 - In march of 2010, I wrote the article (below) about my system for keeping live bait, particularly minnows, alive and healthy. At the time, the system was both legal and extremely effective. Yes, you heard me, every single drop of water that's in your boat needs to disappear before you leave the landing site. I know, it's not easy, but that's the law and unless you like getting pulled over with red lights flashing, like I already have, then we're all going to do some more fine tuning. The good news is that there is still a legal way to save your expensive bait at the end of a fishing trip. All we have to do differently is carry a supply of freshwater in the vehicle. 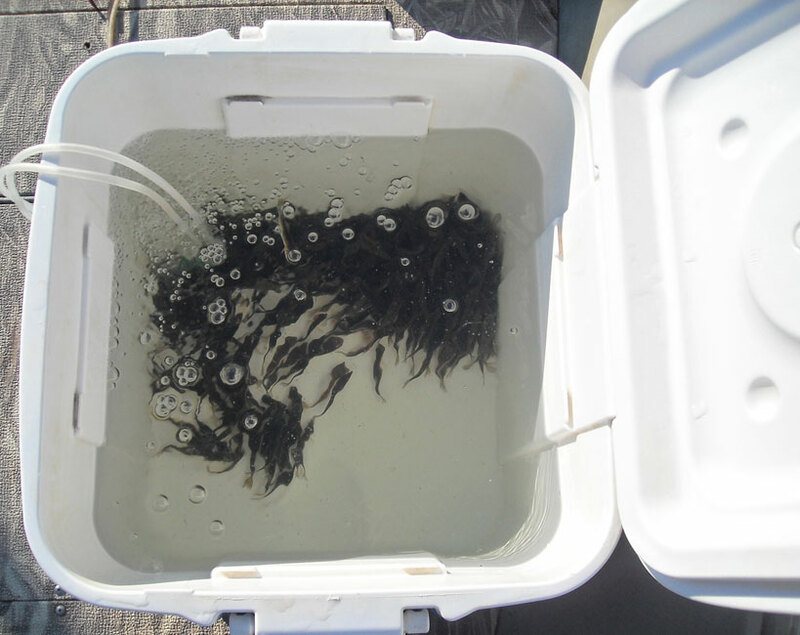 According to Lt. Dave Olsen, District 7 Supervisor for the DNR Enforcement Division, anglers who drain all water from live bait containers that were in the boat, may legally transfer the bait into another container that has a fresh supply of water from home or from the bait shop. After you ready my original, article, it will seem ironic, that one wouldn't be entitled to simply move the cooler from the boat to the truck, but according to Olsen, the letter of the law will not allow that. The water from the boat has to go! For me, the answer will be simple, I'm actually going to kill two birds with one stone. First, I'll rig up an additional cooler and air pump in the pickup. Whenever I need to move from the lake to home or from one lake to another, I'll already have a supply of fresh water all bubbled up and ready to use. For transferring the bait from the boat to the truck, I'm going to make it easy on myself and on the minnows by using one of Lindy's Bait Tamers. I'll be leaving the minnows inside Bait Tamer all day long. That will make it easy to get a fresh one when it's needed and at the end of my day, I'll just pick up the container and move it into the truck, all in one motion. One more twist for me, I'll be changing the coolers a little bit too. I don't want to worry about water splashing over the sides, so I'll be using one of the large round coolers with a threaded top that screws on. As I said in the original article, my system is going to be larger than most anglers will need, but the idea is the same whether you use something smaller or even larger. Apply a little common sense and you'll come up with something that works perfect! When your life depends on fishing, you tend to take seriously, issues about water quality, invasive species and the reliability of future supplies of live bait. As the threat of spreading invasive species increases, ideas about how to control the nasty pests are going to touch the lives of every angler and we've already gotten a glimpse of how some of these ideas will affect us. Restrictions on transporting fish, bait and water have already been in place for several years and there aren't many boaters who haven't already been approached at a launch ramp by the “weed police” checking trailers for evidence of a bit of clinging Milfoil or making sure that live-wells are drained. There's no doubt that the trend toward regulating fishing and boating activities will increase, so for me, searching for solutions has become a priority of daily life. One big problem for me, was how to manage my live bait supply. Here's how I not only solved my problem, but wound up with a better system than I had before. In the past, I (along with the majority of anglers I know) kept the daily supply of minnows alive in the live-well of the boat. That's not a bad way to keep your bait alive, but today all of the water in the boat including the live-well water must be drained before leaving the ramp. Not a big problem if you don't mind discarding your bait at the end of the fishing trip or if you have a supply of fresh water in your vehicle large enough to transport your minnows back home. But for me, this wasn't going to work because of the sheer volume of bait I carry. You see it doesn't look real good for a guide to run out of bait before the end of a fishing trip. Couple that with the fact that I'm never quite sure what we'll need on a given day and there will be lots of times when I carry minnows, lots of them that I may not even need during that day. Shiners, Chubs, Redtails, Rainbows, who knows, it depends on what the fish want so you better have it along just in case. Motivated by the old fashioned American profit motive, my desire not to be forced to discard perfectly good live bait led me in the search for a better bait tank. The good news?You can keep enough healthy, lively minnows on hand to fish all day long, legally transport the leftovers back home and do it all without ever changing your water. That's right, you can leave the bait shop in the morning, use the same water all day, even during mid summer and you can do it without barely losing a single minnow. 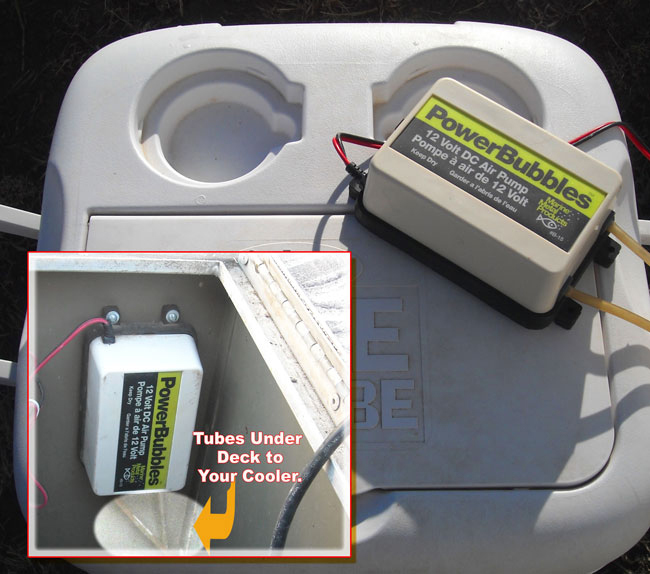 In fact this system works so well that some of my friends have gone slack-jawed in the driveway when I come home at night with a cooler full of nice lively minnows ready to use again the next day. Best of all is the fact that the entire system can be rigged up in your garage for under a hundred bucks! All you need is a cooler, a good aerator and a supply of fresh, cold well water. A separate cooler for your water is essential because it not only helps hold the water temperature down, but also provides you with an isolated location for your fresh water. If I were to simply put fresh water in my live-well, I could get in a sticky situation trying to prove that I hadn't used lake water for filling the live-well and I'd never be absolutely certain that no lake water crept into the system. By keeping the system isolated and filled only with fresh water, I not only comply with the regulations, but I'm guaranteed to avoid accidentally introducing any water-borne invasive species into my favorite fishing lakes. Selecting a cooler is easy because there are so many low cost models available in every shape and size that anyone can find the perfect fit for a spot in their boat. For me, the large “cube” type coolers are ideal because they are deep instead of wide. This makes it easier to hold your temperature, but it also helps cut down on water that sloshes over the top in rough seas. Note in the photo of my setup that I prefer to be able to remove the cooler easily from the boat so my aerator tubes are set up to be easily removed. Obviously, a cooler with better insulation and a tighter fitting lid will do a better job than an excessively cheap model. But I've had great results with typical “off the shelf” models available at most of your favorite discount stores. For me, the most important part of selecting the cooler was finding the spot I wanted to keep it and then getting a size that matched. Your water supply is critical to the system too. Cold, untreated well water is ideal. Cold water helps keep the metabolism of your bait low and the lowered metabolism greatly reduces the amount of Oxygen required to keep the bait healthy. In other words, for the minnows benefit you're better off with one cooler full of cold water than with a swimming pool full of warm water. Your favorite bait shop probably keeps the fresh water flowing at temperatures in the low 40's and adds aeration besides. Keeping live bait fresh can be the secret to catching fish on a tough day. You can keep your valuable bait alive all day long on one tank of fresh water. For lots of us, it's worth the effort in terms of saving money. But it's also the best way to keep invasive species from spreading to your favorite fishing lake. Lindy's Bait Tamer's will make easy work of transferring minnows and Leeches from the boat into a supply of fresh water on board my vehicle. The five gallon size (above) will work great for me, but if you want to use your livewell, the fifteen gallon version (below) will be great! 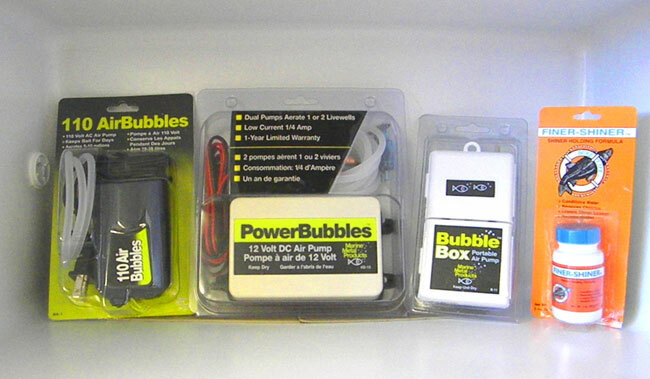 My favorite system is the Power Bubbles 12 volt model by Marine Metal Products. I install the pump under the deck where it's protected from the weather, but it can be easily used as a portable unit. Walk into any bait shop and you'll find several models to choose from. If my system seems too big for you, just scale it down to fit your needs. I'm lucky because living in a rural area, well water is available in my back yard. For folks living in urban areas with chemically treated water, you're better off filling up your tank at the bait shop when you buy your minnows. This water is perfect because the temperature, typically in the low to mid forty degree range already matches the water your bait has been living in. When you can't find well water, a visit to the aquarium section of a pet shop and get the water treatment used for fresh water fish. This removes harmful chemicals and will do a fine job of keeping your bait alive. Portable aerators are available everywhere, but you will not find anything that works better than this model sold by Marine Metal Products. This is essentially a 12 volt version of the same type of pump that you'd buy for a home aquarium. 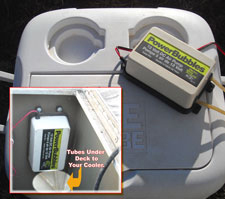 It provides lots of power and tons of bubbles that will keep your minnows nice and fresh. The kit comes with all of the wiring, tubing and stones that you'll need to install it. For me, this unit runs quietly and reliably 24/7 all summer long. Installing it permanently under the deck keeps it out of the weather and allows me to hard wire it in to my main batteries. Everyone has different needs and I know most anglers don't need to keep as much bait on hand as I do, so go ahead and customize. The fishing stores and bait shops are loaded with products similar to what I've mentioned here, so if it sounds like my system is a little big, just scale it down to suit yourself.